Unwind after a long day on land aboard a City Lights Cruise. Gaze at the glittering lights of the city as light dances on the waters of Boston Harbor. 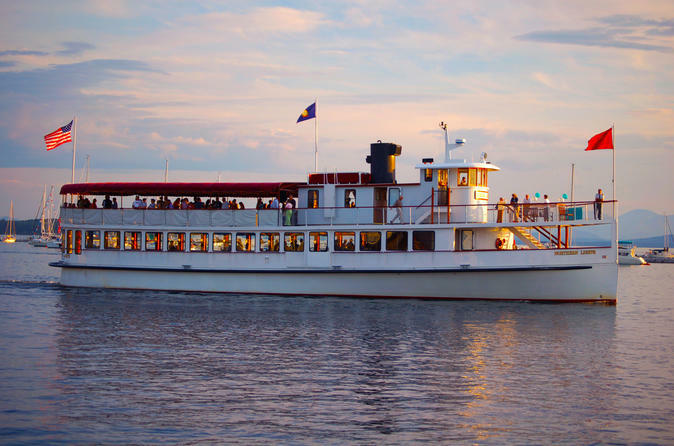 Sit back and relax with a loved one for a romantic after dinner cruise or see the City Lights with a group of friends to experience the twinkling lights of Downtown Boston. Enjoy the buildings of Downtown Boston such as: the Custom House Tower, International Place, Independence Wharf, and the New England Aquarium. Pass by the U.S.S. Constitution and hear how she got the nickname "Ironsides." Marvel at the construction of Leonard B. Zakim Bridge. Check out the colorful lights on the buildings in Boston’s Seaport District such as: the new Vertex Building, World Trade Center and the Institute of Contemporary Art. Ship offers bench seating in the open air on our top deck as well as a climate controlled interior cabin. Adult beverages, soda, water, and snacks are available for purchase.